I do not know from when I had fallen in love with Darjeeling. I cannot place a precise time frame from when I had yearned for that place. It was also not the first hill station to be visited by me. In fact, I had already traveled through Jammu and Kashmir and had seen Mussorie. They were splendid hill stations but my mind somehow wandered towards Darjeeling. Blame it on the Feluda stories, which started from Darjeeling or on the wonderful songs of Anjan Dutta weaving dreamy tales about it – both are my favourites—Darjeeling always stood out. Always!!!!! I visited Darjeeling for the first time in 1992, when I had just completed college and Darjeeling had just recovered from a rather bloody phase of unrest. The feeling of waiting to see my beloved was so overwhelming that I scarcely noticed any thing on the three and half hour journey from Siliguri. Then after Ghoom, when the car turned one more S-curve on the road, there loomed she – the queen of the hills. Four days of intoxication followed – intoxication of colours, smell, peace and -----, I don’t know what else. I came back happy to have whetted my thirst for the place. There was satiety in having known my beloved so closely and there was hunger for more – much more. And not even the fact that I could not get a single glimpse of Kanchenzonga during that period of stay could take away my happiness!! I have visited Darjeeling about 8 to 10 times after that and my thirst refuses to get quenched. These days I know the curves of the Hill Cart road so well that I can even drive in the night. I have a crush on the hot chocolate and sausage breakfast of Keventers. I love the liquor chocolates of Glennarys. I have another affair with the Joeys Pub. I love to wake up early and take a walk around the Observatory hill as the Majestic Kanchenzonga looms in the front and takes a bath in the light of the rising sun. I love taking lonely walks around the tea gardens. I love watching the Blue Toy Train making its meandering progress. I love sitting upon the observatory hill, watching the sun set in the distance. But best of all, I love to sit lazily on one of the green benches in the Mall, doing absolutely nothing as hordes of people move around. I know that crass consumerism is eating away at my beloved. I know the various struggles of recognition by various sects have eroded the Buddha like calm of the place. I know that the visiting throngs have denuded away the water reserve of the place. I know that the knowing population speaks highly of other places like Kurseong, Pelling, Ravangla and Sikkim. But can you do away with your beloved and look for new love just because your love of your life has fallen ill? Does a love affair look into physical deformity? No way, sir. 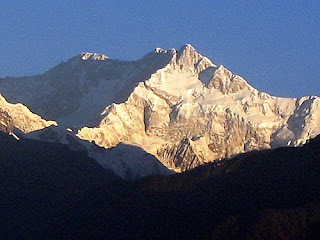 I love my beloved Darjeeling. To me, Darjeeling is like my best friends fiancé…A relationship of hidden love and jealousy. I spent my childhood in “not so far” distance from Darjeeling. Even the climate of our small town depends on the mood of great Kanchanjangha. Chilled wave of winters brings news of snowfall on the hilltop. Rain carries smell of dooars. There were plenty of stories with lot of souvenirs that I received from my relatives and friends who just had been there to spend durga puja vacations. Dad taught me how toy trains goes up top in ghum and comes down for Darjeeling. It was so close to me that I knew almost everything about Darjeeling without been in there. I have visited almost all major hills stations of northern India. Even Ladakh. But Darjeeling is the most secret desire for me. Just like my friend’s fiancé. She can come in dreams only. Yes, I still in love with Darjeeling very secretly. You are right u know, its hard to escape the charm of Darjeeling.... the magic just gets into your blood and stays with you forever.....and I can never forget that azure sky and the golden orange kanchenjanga peak from the window of Glenarys. Thanks for visiting my blog and sharing your memories. I am a Bengali and I love detective fiction, so no wonder I love Feluda, too, though my heart belongs to Lalmohonbabu. Darjeeling holds wonderful memories for both me and the spouse. We've visited it twice, once as newly-weds, and once with our first-born daughter. It's very, very special to us. Now that we are in far-away Mumbai, when the annual Kolkata-visit is choc-a-block with visits to sundry relations/friends/banks/etc, Darjeeling has receded to become a dream-topia in our family-memory. Your post brought back very, very pleasant memories. Thanks. Darjeeling indeed is a very romantic place...the charm never recedes although you go again & again there...the entire atmosphere their is so mesmerisical...journey in the toy train, sitting at the mall, scrolling in the up & down roads,viewing the majestic Kanchenjunga, hearing the sound of the pine leaved Darjeeling is indeed an enchanting place and our beloved!